For a recent event, Nikki from Doodle Dog and I teamed up to create a cupcake bar. For this summer party, we wanted some fun flavors and bright colors. 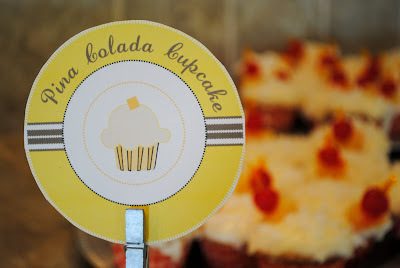 Nikki designed some signs to put on the cupcake bar to identify the flavors and add a playful feel reminiscent of a 1950’s soda shop to the buffet. 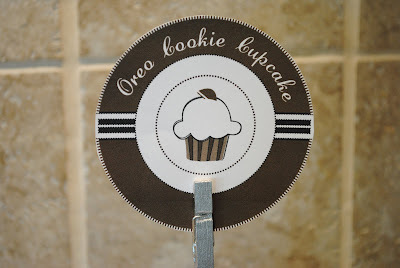 What really elevates this cupcake bar to the next level are the special little touches of detail. Sure we could have just set out the cupcakes on plates and called it a day – but putting in the extra effort to add cute little coordinating signs and adding garnishes to the cupcakes makes it all special. The signs were made on heavy smooth white paper. Carrying the same design theme from sign to sign really helped tie the entire cupcake bar and all of the flavors together perfectly. Nikki crafted the silver stands for next to nothing with some cheap finds and a can of paint from Michael’s. 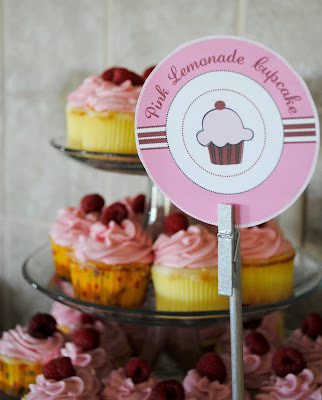 Each stand held one of the circle signs that coordinated with the matching cupcake flavor. All of the cupcakes were displayed nicely on some chargers that we also painted silver to match the rest of the bar. Oreo Cookie Cupcake – a cookies and cream cupcake with half an Oreo on the bottom and more chunks of Oreo mixed in to the batter. Topped with classic cream cheese icing and garnished with another Oreo cookie. Piña Colada – a coconut cupcake topped with a pineapple cream cheese icing and coconut flakes. These were garnished with a pineapple and maraschino cherry pick. 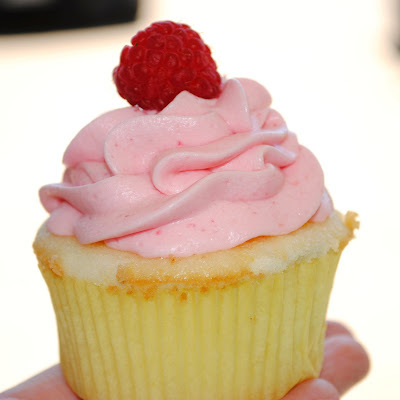 Check back soon for the remaining cupcake recipes and head on over to Nikki’s blog to see what she’s working on next. Preheat the oven to 350 degrees and line 12 cup muffin tin with liners. Sift together flour, baking powder and salt in a small bowl and set aside. Add sugar and lemon zest to mixing bowl or stand mixer and rub zest into sugar with your fingertips until well distributed and fragrant. Add the butter and cream cheese to the sugar and beat until light and creamy, 2 - 3 minutes. Add the eggs, one at a time, beating about 1 minute after each egg. Add 1/3 of the flour mixture, beating on low speed until just incorporated. Add 1/2 of the buttermilk, once incorporated, add the next 1/3 of the flour mix, followed by remaining buttermilk, and remaining flour, beating each addition until just incorporated. Add lemon juice, beating until just incorporated on low speed. Transfer batter to muffin cups, filling each about 2/3 of the way full. Bake for approximately 20 minutes or until a toothpick inserted in the center cupcake comes out clean. Cool about 5 minutes in the pan and then remove to a wire rack to cool completely. Cream butter in a mixing bowl until smooth. Add in raspberries and lemon extract and beat until most of the chunks are gone. Add powdered sugar, one cup at a time, beating on low speed until incorporated. Increase speed to medium and whip for about thirty seconds. Transfer to a piping bag and decorate as desired. Top with fresh raspberries if desired. Wow, these look so good! I can't wait to make these. I plan to make them Friday night for my sister's bridal shower on SAturday. All of these cupcakes sound delicious!! So many cupcakes to choose from! YUM!!! yum! who doesn't love cupcakes?! hey, i'm just contacting you to let you know that you won my giveaway! please contact me at karaspartyideas@yahoo.com with your address so the alphabet molds can be mailed to you. So pretty. 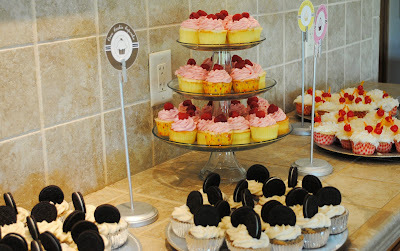 Love the idea of the cupcake bar, how fun! I came to your blog by way of The Foodie Blogroll, and I just want to say that your blog is wonderful! I just signed up to become a follower. @The Sugar Queen -- thanks for following - hope you enjoy! 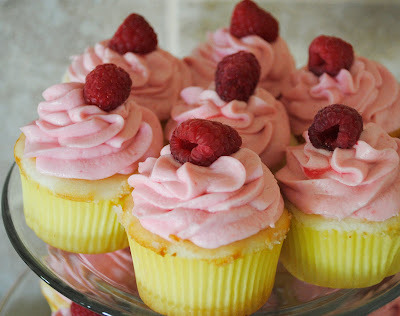 I looove raspberry and lemon together! These look amazing! I made this 100% to the recipe (and I keep double checking and re-reading) but they shrank. They didnt sink in, they literally shrank- a lot. and now they are really dense, not quite sure why. They taste good though. @Rachel - sorry they didn't turn out for you, maybe your oven temp is off or your baking soda/ powder isn't fresh (can't remember which it takes at the moment.). Maybe they just weren't quite done or maybe it has something to do with the humidity.